Many Indian paths followed the ridgelines to avoid the swampy lowlands; later roads followed and improved these paths. 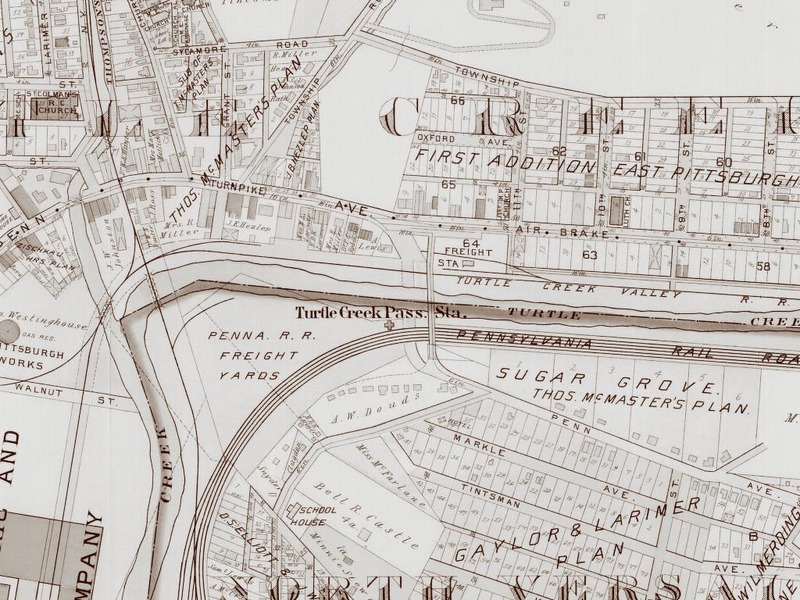 Venturing westward toward Pittsburgh, the path of what would become Greensburg Pike avoided the "defiles of Turtle Creek" by tracing the high line to the south of the Great Valley -- one of the local nicknames for the Turtle Creek Valley. In East McKeesport, at one of the highest hilltops in Allegheny County, the path was forced to descend into the valley as the hillsides got only more severe approaching the outflow of the creek into the Monongahela River. A mile-long, nine percent grade took the path to a crossing of the creek (the location of this bridge). Crossing the bottomland and continuing westward, the path made another steep ascent to follow another ridgeline from Turtle Creek to another hilltop between Wilkinsburg and Churchill. On Lime Hill (Churchill), another of the highest hilltops in Allegheny County, the Greensburg Pike and the Northern Turnpike met. This site has been noted as the location of one of several places called "Bullock Pens." Local historians say the pens were an important source of livestock for the military forces in early Pittsburgh. The Forbes and Braddock Roads had been built as military roads. The routes suited their purposes, but over time, the State Road modified the route from the east. An 1806 act authorized a new turnpike to be constructed, with commisioners in the various counties along its route. Dividing the routes into section made fundraising by stock subscription easier. An 1811 act authorized the commonwealth to provide $300,000 to the company which could raise $150,000 in stock. A competition developed between the southern route (which included the Greensburg Pike) and what would become the Northern Turnpike. The rivalry delayed the construction of both, with the Northern Pike opening locally in 1819 -- after the southern route. The section of the southern route known as The Pittsburgh and Greensburg Turnpike was promoted by Westmoreland County Associate Justice Colonel John Irwin. In 1814 the road was opened "past the Colonel's home on Brush Hill Road in Irwin, as well as his brother's house on Verdant Drive" and westward to Turtle Creek. By 1820, the toll road was expanded to reach from Philadelphia (roughly along the line of today's US30 - Lincoln Highway) to Pittsburgh along Penn Av. Dates found in various sources indicate that the construction in Western Pennsylvania progressed from west to east. William Wilkins, judge and namesake of the nearby town and township, was president of the Pittsburgh and Greensburg Turnpike Company. Managers included other prominent citizens: William Carver, William B. Foster (father of songwriter Stephen Collins Foster), William Fullerton, William Hindman, James Irwin, Abraham Horbach, Dunning McNair (part of early Wilkinsburg was once McNairstown), Jacob Negley Jr., Tobias Painter, Ephraim Pentland (newspaper publisher and politician), Robert Patterson and Thomas Simpson. In 1857, Mr. Joseph B. Hezlep, was advised by a Pittsburgh merchant to locate at Turtle Creek, and go into business there. The friend had great hopes for the future of that place and as one of its drawing qualities, said that it was the center for seven country roads all centering in Turtle Creek village, and that it would be a good place for a merchandise business. The journal of George Washington dated November 23rd, 1770, this entry: --- "After settling with the Indians and the people that attended me down the River, and after defraying the sundry expenses accruing at Pittsburgh, I set off on my return home and after dining with Widow Miers, on Turtle Creek, reached Mr. John Stephenson's in the night." The dwelling of the Widow Miers, or Myers family, mentioned in Washington's diary, was a stone two-story building built with loop holes along the eaves for lookouts in time of danger, and was located on the south side of the hill, now the property of A. O. Tintsman, Esq., at the corner of what is now known as Sycamore and Monroeville avenues. Her land is called the "Widow's Dower" in the patent, which is the oldest in the country. She probably settled there immediately after the land fell into the undisputed possession of the English. About the year 1888 the Westinghouse Air Brake Company purchased the "Osborne" Farm east of and adjoining Turtle Creek village and located along Turtle Creek stream. The farm land extended from the steep hillsides down to the stream and along its water for about half a mile, the Pennsylvania railroad tracks passing along the creek bottom. In the year 1890 the Westinghouse Electric and Manufacturing Company purchased the bottom land of the McMasters farm, starting from the Westinghouse Air Brake property at Wilmerding, and running westwardly along Turtle Creek. The purchase also included the John Black farm, lying west of Turtle Creek village, for one mile along the stream of Turtle Creek. Three miles up the valley is located the Westinghouse Foundry at Trafford City, where the iron castings are turned out, rails are necessary to carry the electrical contrivances. The foundry plant is connected with Turtle Creek and East Pittsburgh by an electric inter-works railroad. On this road the electric locomotives are tested out, and are speeded back and forth running a thousand miles before being shipped to the buyer. The Westinghouse Electric Corp. East Pittsburgh Works extends about two miles along Turtle Creek, north of the Westinghouse bridge. George Westinghouse achieved the first practical application of alternating current for electric power transmission in 1886 with a demonstration wire between the Golden Triangle and Lawrenceville. Realizing what an immense demand his system would create for generators and electric machinery, Westinghouse purchased 500 acres of land in the Turtle Creek Valley in 1887 as the site for a giant factory complex, but fierce opposition from Edison and the partisans of direct current electricity forced him to stay his hand for six years. In 1893 Westinghouse scored two decisive triumphs over Edison by supplying AC electricity to the Chicago Fair and exploiting the water power of Niagara Falls: the next year the East Pittsburgh works opened to national and international acclaim. The plant employed 20,000 workers at its peak, many of whom lived in the small homes that were built for them by the Westinghouse land company in the nearby valleys and mesa tops of East Pittsburgh, Turtle Creek, Trafford, and Wilmerding. An impressive group of these wooden homes and boardinghouses stands north of the plant on Brown Avenue (Route 130 North), toward Churchill. From the plant came the world's first electric locomotive, first regular radio broadcast (on Pittsburgh's KDKA), and first electronic television camera. Much of the old complex was clad in a metal skin in 1957 (one manufacturing aisle was seven stories high and three football fields in length), but Thomas Rodd's French Renaissance administration building, where Westinghouse worked, is still intact. It is two miles from Westinghouse Electric to the Westinghouse Air-Brake Works in Wilmerding (reached via Route 130 South on the Yellow Belt). Frederick Osterling designed and Westinghouse himself supervised the building of these handsome brick foundries and machine shops in 1890. Around the factories Westinghouse laid out the model industrial town of Wilmerding (the name recalls Johanna Wilmerding Negley, whose family had farmed this valley for generations). Atop a little rise in the center of town was a library and community center with a swimming pool and baths, evidently inspired by Carnegie's prototype at Braddock. When the library burned in 1896, Westinghouse directed Osterling to rebuild it in grander style, without the public facilities, as the Westinghouse Air-Brake General Office Building. Janssen & Cocken added the wing on the left in French Renaissance style in 1927. Superannuated in 1984, it is now destined to be a conference center for the non-profit American Production and Inventory Control Society. A factor in Westinghouse's selection of the Turtle Creek Valley was its prominent location on the Pennsylvania Railroad mainline between Pittsburgh and Philadelphia. The rail line had been completed from Pittsburgh to Turtle Creek in December 1851. A final section completed in November, 1852, opened the line to Philadelphia. The borough of Turle Creek was incorporated in 1892. It included perhaps the oldest post office in this part of the county. By 1910, it was reported that 102 daily trains stopped at either East Pittsburgh, Turtle Creek or Wilmerding. The four Westinghouse companies employed as many as 25,000. An aerial map of the town of Turtle Creek, drawn by Thaddeus M. Fowler in 1897, shows the PRR had expanded to five lines. Greensburg Pike crossed the railroad and creek on a Howe truss near the passenger rail station which stood south of the stream. 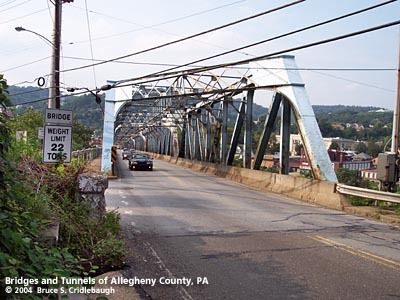 This older bridge was set a an angle which matched the street grid of the valley, thereby creating a sharp turn for traffic descending from East McKeesport. At the northern end of the bridge, stone ramps split in opposite directions to meet Penn Avenue (Airbrake Av) near Eleventh St. In 1913, the Lincoln Highway Association was established, plotting a coast-to-coast all-weather road across the United States. The route through Pennsylvania followed today's US30. The original course followed Greensburg Pike into Turtle Creek and Electric Avenue out of East Pittsburgh westward toward Pittsburgh. [postcard, Lincoln Hwy, Turtle Creek, c1930] This path included a mile-long, nine-percent hill leading to the old bridge over the stream and railroad at Turtle Creek. To enter the bridge, motorists had to negotiate a sharp, dangerous turn at each end of the bridge. Once in the valley, the then bustling traffic and activity from the town and surrounding factories created major delays. Some reported an hour travel time in crossing the two miles through the valley. By 1925, the Lincoln Highway and other named roads were displaced by a federally-established numbering system of US Highways. 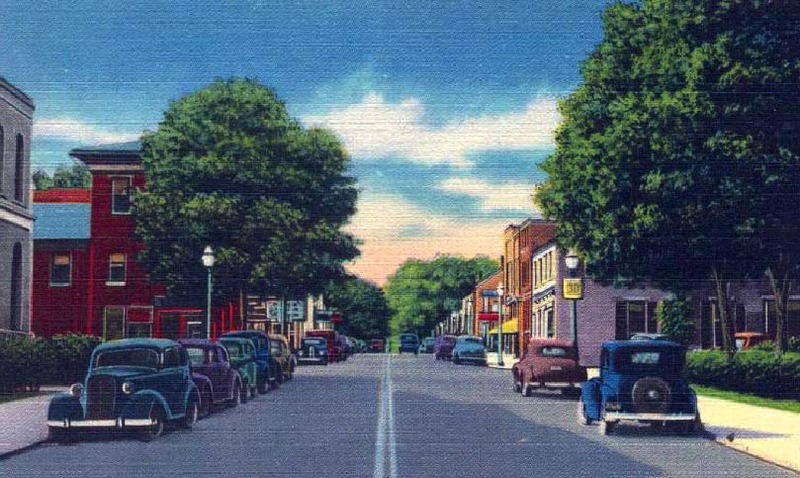 What had been the Lincoln Highway became US30. Noting the travel difficulties through Turtle Creek, Allegheny County began to make plans for relief. 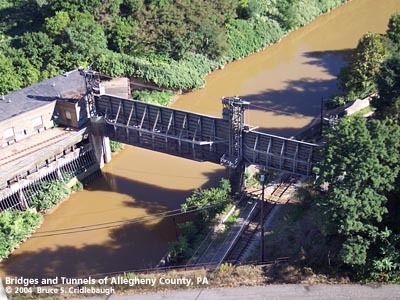 Working in conjunction with the Pennsylvania Railroad, a new multi-span, through-truss bridge was opened in 1925 to carry Greensburg Pike over the stream and tracks. By incorporating a series of skewed trusses, the dangerous angles were decreased. The new bridge touched down Monroeville Av, approximately two blocks west of the northern end of the previous bridge. This also made a more logical connection to local streets and their regional connecting roads. Soon after, the county began construction of a bypass to carry US30 over the Turtle Creek Valley. The George Westinghouse Bridge, the largest concrete arch bridge when completed in 1932, was a $1.75 million part of the $4.4 million Lincoln Highway re-routing project. Below the Greensburg Pike Bridge, the Turtle Creek Flood Control Project was completed in 1967 by the US Army Corps of Engineers. Sloping concrete walls contain the stream from Wilmerding downstream past East Pittsburgh. Below the Westinghouse Bridge in East Pittsburgh, a movable vertical gate dam (no longer operational) was designed to prevent back flooding from the Monongahela River. The 7 span, 845'-long bridge built in 1925 is composed of 4 rivet connected Pratt thru truss spans (166', 192', 192', 140') and 3 steel deck girder approach spans (52', 52', 42'). The truss spans have built up members of standard steel sections. A cantilevered sidewalk with standard county pipe railing is on the south side. The bridge is supported on concrete abutments, built-up steel bents for the approach spans, and concrete piers for the main spans. Safety shape concrete barriers enclosing the roadway are from a 1978 deck replacement project. The bridge is a late example of its type and design that is not individually distinguished by its technology. The bridge's significance is in association with the development of the PHMC-determined eligible PRR Main Line. It dates from the line's period of significance and it is associated with efforts to improve the safety and efficiency of the line by improving grade crossings. The bridge was built as a joint project of the railroad and the county. The bridge carries a 2 lane road and a sidewalk over a stream, a private access road to the Westinghouse plant, and active Conrail tracks. The setting on the Turtle Creek-North Versailles line is a mix of late 19th to late 20th century commercial and residential buildings. The Conrail line is the former Pennsylvania RR Main Line that has been determined eligible by PHMC (9/14/93). The line is significant for its historic role as an important east-west through route established in the 1850s. The boundaries and period of significance of the line have not been specified by PHMC.